To add more flavor to this saucy favorite, we suggest Hungarian paprika. It comes in both hot and sweet versions. In a 10-inch skillet cook mushrooms, onion, and garlic in melted margarine or butter over medium heat about 5 minutes or until vegetables are tender. Stir in paprika and pepper. Cook and stir for 1 minute more. Stir in cubed cooked chicken, chicken broth, and tomato paste. Bring to boiling. Stir together sour cream and flour. Stir into mixture in skillet. Cook and stir until thickened and bubbly. Cook and stir for 1 minute more. 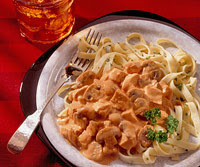 Serve chicken mixture over noodles. Garnish with snipped parsley, if desired. Makes 4 servings. Calories 587, Total Fat 32 g, Saturated Fat 12 g, Cholesterol 127 mg, Sodium 670 mg, Carbohydrate 44 g, Fiber 3 g, Protein 32 g. Daily Values: Vitamin A 32%, Vitamin C 5%, Calcium 11%, Iron 4%. This entry was posted on 2:31 AM and is filed under Chicken . You can follow any responses to this entry through the RSS 2.0 feed. You can leave a response, or trackback from your own site.